"Only with a light is truth visible." Publisher Gary Koeppel and Editor Paula Walling with proof reader, son Noel. During the four years I published the Big Sur Gazette, Captain Cooper teacher of 31 years, Paula Walling (www.anitaalan.com) dedicated countless hours photographing and writing timeless articles about the people and history of Big Sur while also sleuthing and writing about the nefarious and mindless provocateurs who strove to convert Big Sur into a National Park. I have now published the Gazette online so that future generations can read and learn about the history of past battles so they will be armed with the knowledge to fight future battles in the war for personal freedom and private property. 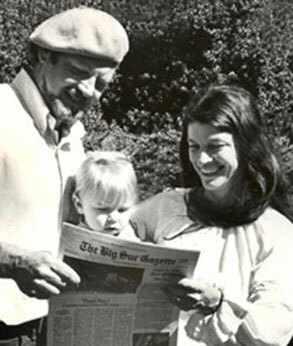 The Gazette was the voice and a major player in the last Battle for Big Sur, a feat that required personal time, sacrifice and money-at literally no cost to the Big Sur Community. Now it is time for some pay back. Our dear editor and feature writer, Paula, has a serious and ongoing medical condition. She gave selflessly to save Big Sur and she now can use your help. Thank you in advance for your donation for her for her current struggles.